Brazilian Jiu-Jitsu (“BJJ”) is one of SBG Tullamore’s core training programs. The premise of Brazilian Jiu-Jitsu is that a smaller, weaker person can defeat a stronger and larger opponent, through leverage and proper technique. Brazilian Jiu-Jitsu is primarily a ground-fighting art, where the practitioner’s train in a gi or “kimono”. 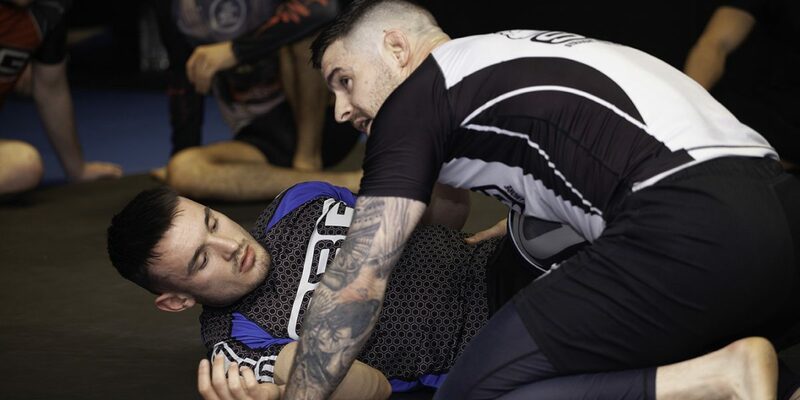 The techniques involve the students on the mat, with a heavy emphasis on positional control, strategy, drills, and live rolling, to help with your submissions and techniques. Once in proper position, many different types of submissions can be applied such as: armbars, wrist locks, chokes, and leg locks. Some of the primary positions include, but not limited to are: Guard, Mount, Side-Control, Back Mount, and so on. SBG Tullamore’s Brazilian Jiu-Jitsu programme has a structured belt grading system for all classes, including kids. We follow the belt ranking system of the IBJJF. We also have a structured curriculum, so you will progress according to your belt level, as well as being exposed to advanced techniques and self defense moves as part of your overall training. SBG Tullamore provides an excellent beginner programme for those just starting out. Learn the art of Brazilian Jiu-Jitsu from our certified instructors in a clean, safe, environment.This is the program you’ve been looking for to take your combat sports training to a higher level.